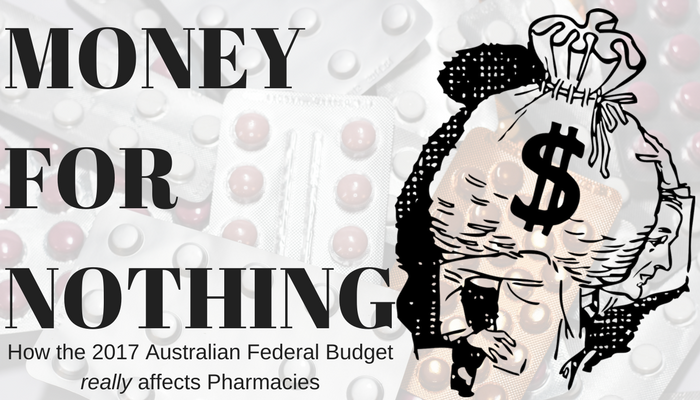 “Money for nothing, get your cheques for free” – are retail pharmacies the winner in the federal budget? The news printed the day after the federal budget read like a Dire Straits song, Money for Nothing. According to the media, retail pharmacies will be better off to the tune of $43,000 for essentially doing nothing. Not only is the amount reported incorrect, but the media failed to report the full story. the budgeted script numbers included in the 6th CPA* agreement. This $200M will be paid as an adjustment to the AHI* fee over the life of the 6th CPA. The budget also includes $10M in funding for the pharmacy industry over the life of the 6th CPA. This measure is hardly ‘money for nothing’ and it is instead designed to compensate the retail pharmacists who have seen reduced net profit driven by PBS price reductions over the past few years. The sum will be paid in 2018-19 and 2019-20 as a further adjustment to the AHI* commencing on 1 July in each of these years. If you add both of these amounts ($10M + 200M) together and allocate them equally to the 5600 retail pharmacies around Australia, each would receive $37,500, not the reported $43,000. This is not a large sum of money and will only have a minimal impact on the bottom line. What’s worse is that the larger pharmacies will receive a larger chunk of this funding because the remuneration is based on script volume. The larger pharmacies, including Chemist Warehouse, already enjoy a lot of advantages in the market like higher turnover and buying power which results in higher margins. The smaller independent retail pharmacies who really need this assistance will end up short changed as they have lower script volumes and will not be entitled to as high a proportion of this remuneration. However there is some positive news on the horizon. The removal of the sunset clause within the national health act in relation to location rules. Once the law is amended this will remove some of the uncertainty faced by pharmacists every 5 years when the CPA agreement expires. While all in all there was some positive news for pharmacies around Australia, I don’t think that they will be getting their cheques for free. Given that the budgeted amounts will be distributed based on script volume, the smaller independent pharmacies may still be left in Dire Straits. I am an Accountant at Marsh Tincknell Accountants specializing in Pharmacy Accounting with 15 years’ experience as a Pharmacy Manager. I bring in depth knowledge and strategy to the Accounting for Pharmacy specialization. I hold a Diploma in Accounting, a Bachelor of Pharmacy and DMAS accreditation from the Australian Association of Consultant Pharmacy. For more weekly content – follow Marsh Tincknell Accountants Blog on our website – linked here. Alternatively, contact Marsh Tincknell on (07) 3422 8000 to discuss your business & its strategy.